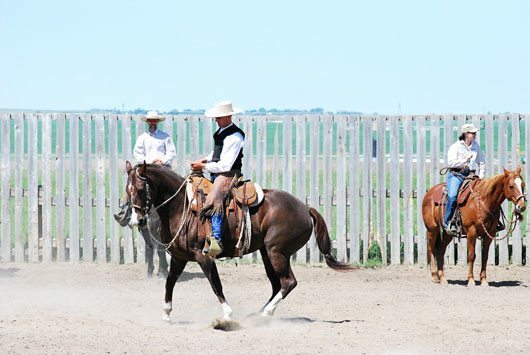 Traditional Vaquero horseman Richard Caldwell of Alturas, California travelled to southern Alberta for his June 26 – July 1 clinic, Caldwell’s third clinic held west of Nanton, hosted by Laurie Messner and Randy Patton at Winning Strides. 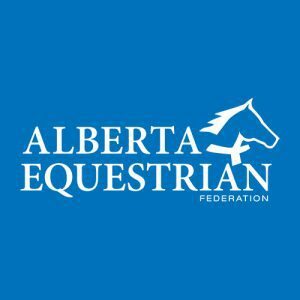 Writer Darla Rathwell attended the clinic on behalf of Western Horse Review. Here is her account for the day. Gorgeous photos, Darla! 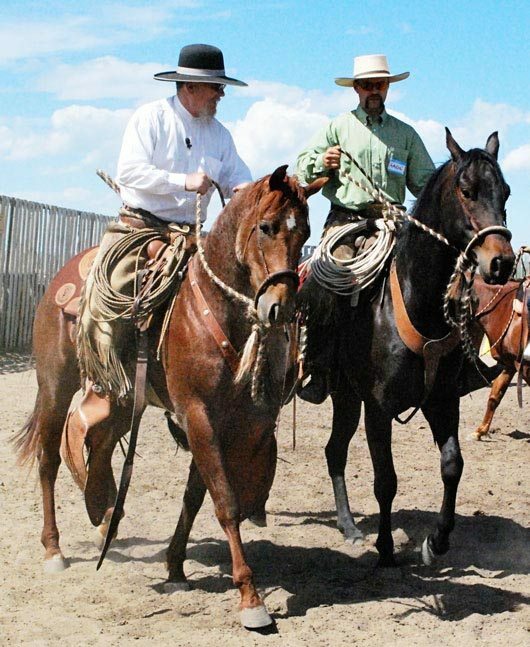 For Richard Caldwell, Vaquero horsemanship is a way of life. 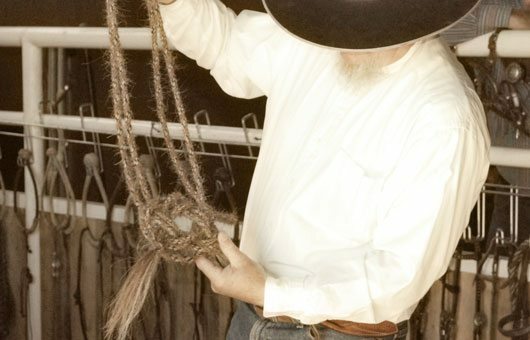 For 30 years he worked as a buckaroo and values the traditional Spanish Vaquero methods that date back to the 1700’s. 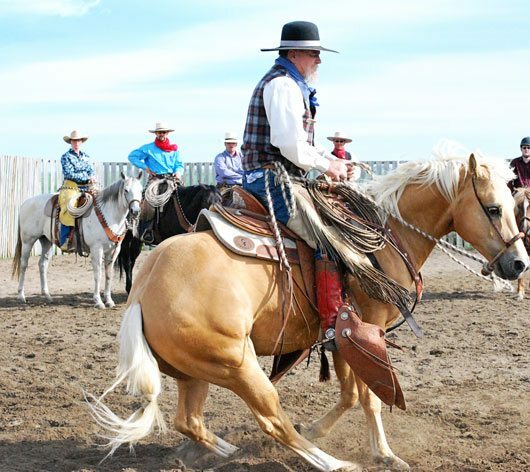 In his clinics he works with intermediate to professional horsemen showcasing his traditional tack, values and horsemanship, carrying on skills from men that relied solely on their horses and was treated in such a manner to save the horse not use him up. 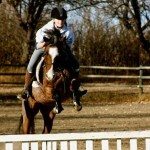 There were 12 riders in the first three days of the clinic. 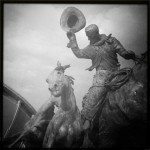 These horsemen and women tucked their egos in their back pockets, opened their minds and went to learning the Vaquero way. The next three days were semi-private sessions for riders that had previously ridden with Caldwell, working on fine tuning their skills. Day one of Caldwell’s clinic begins with a tack talk to give the clinic riders and auditors a clear understanding of the equipment and the importance of its quality, after that it’s straight to the arena. Here Caldwell demos the placement of the bosal on the widest part of bone on the horse’s nose, just above the cartilage. 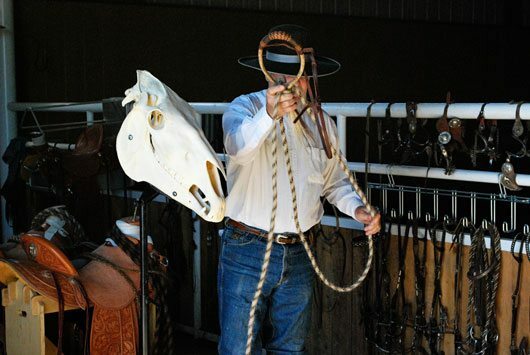 Caldwell shows how to attach the metate to the bosal, making only one wrap around the heel knot clock-wise keeps the bosal balanced, more than that can make the bosal unbalanced which causes bouncing taking away your horses sensitivity. 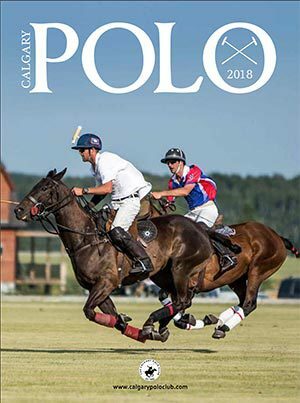 A piece of tradition, the Alamar knot is worn around a horse’s neck to signify and honour a finished bridle horse and shouldn’t be worn otherwise as this would be disrespectful. Once in the arena Caldwell demonstrates how to get the horse to stay in a symmetrical circle with his two year-old roan stallion, Sumkinda Rey (by Dual Rey out of a Peptoboonsmal mare),teaching riders to only correct their horses when necessary, then immediately letting go, rather than hanging on, which causes a mechanical movement. Caldwell rides through the counterbend with Aaron Cunningham while he is working on getting vertical flexion on Hanabar Seeker. 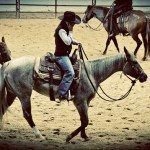 Caldwell explains how to get the bend in his horse’s neck, not just tipping of the nose to the inside. 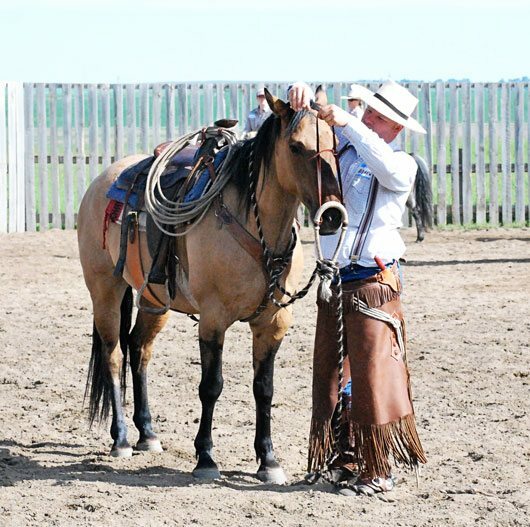 By having Andrew Harms of Cochrane adjust his bosal placement ever so sightly on his gelding’s nose, he will give his horse an instant signal rather than one that will numb his horse to his hands. Day two was spent working on collection, counterbends, backing, and learning to correct by using less hand and more leg. Here Caldwell demonstrates on Starlight Nights, a three-year-old gelding by I’ll Be Smart out of a Greys Starlight mare. 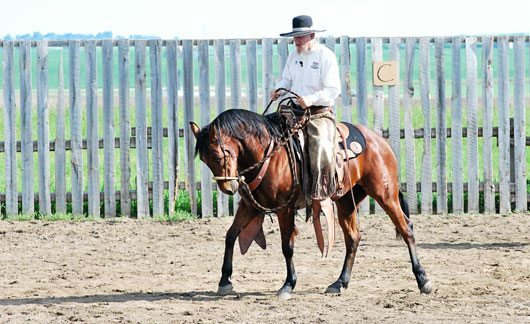 Caldwell is demonstrating how to get your horse to bend at the withers, rather than breaking at the poll making it easier to gather your horse up, or get collection. 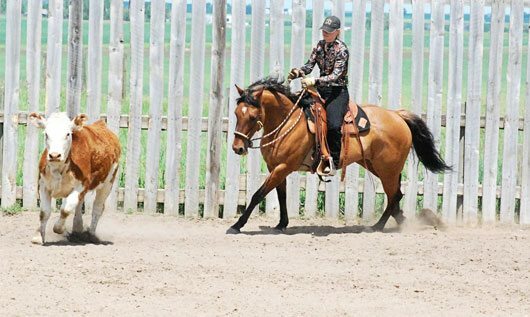 Morgan Saranchuk – working cowhand from the McIntyre Ranch in southern Alberta – works with his seven year-old-mare, Extremely Flashy, in the two-rein. 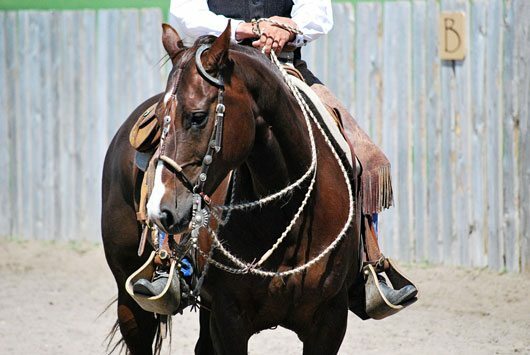 Once a hackamore horse is over the age of six and has a full mouth of teeth, the spade bit will be intorduced to the horse along with his hackamore, a transition period of a year or longer called the two-rein. 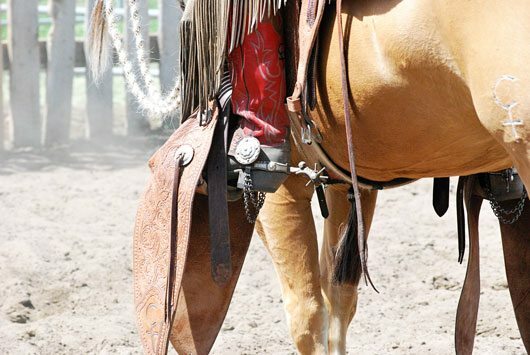 During this period the bosal that is used is thinner: about 3/8″ in diameter and called a bosalita. Gradually eliminating the hackamore, the horse will be known as straight up in the bridle, or a finished horse. 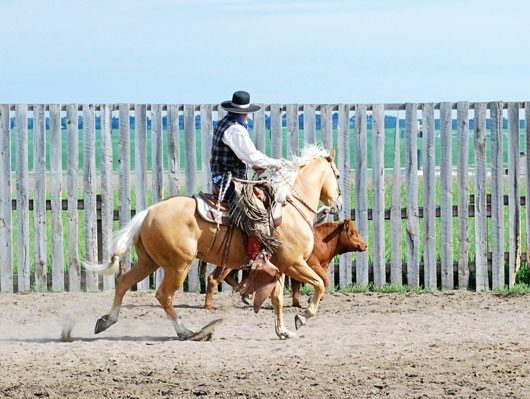 Here Caldwell rolls his four year-old gelding RC Vaca Caballo, by Yellow Roan of Texas out of a Nu Cash mare, back over his hocks for the turnaround. Day three of the clinic, riders began with tracking a cow. 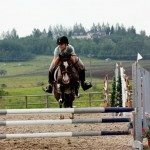 Laura Alexander on her mare BSF Girl Leo High, follows in her cow’s footsteps without cutting corners, does a fine job keeping her inside shoulder up, so that her horse doesn’t drop her inside shoulder in the turn. While boxing Caldwell keeps the horse’s head to the inside, this keeps the horse’s eye on the cow. 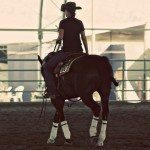 With this vertical flexion he is able to stop the horse with his inside rein; turns toward the cow, leading with the nose follows by his leg making him more athletic. 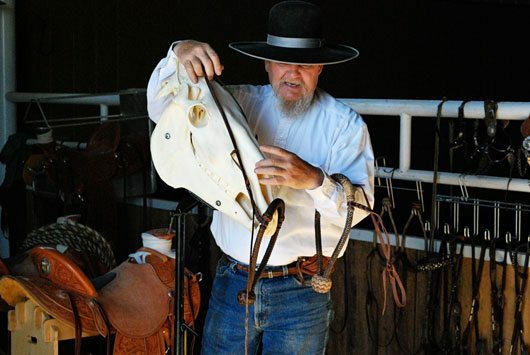 What was becoming a lost tradition is reclaiming its true value and making a comeback through the efforts of traditional horsemen like Richard Caldwell. 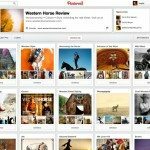 Visit Caldwell at www.vaquerohorseman.com. 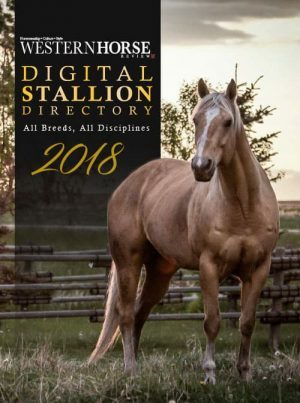 This is a great report and photos of a fantastic and proven methods. The photos helped a lot. Was there a large attendence? Hi Ernie, glad you enjoyed it. And yes, I think the clinic was filled, plus spectators. 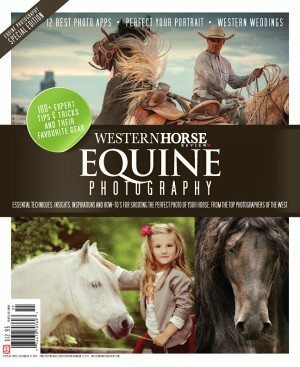 Thank you for the coverage on this master horseman Ingrid. Few have all the knowledge put together in one package as Richard does. 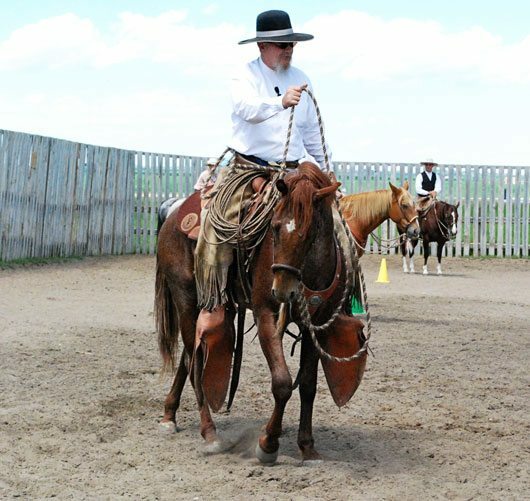 I spent many an hour watching Richard teaching at the Winning Strides Clinic in June, he’s not only a master at the hackamore and bridle horses, he is a wonderful teacher to all levels. 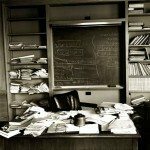 Great story with great pictures! !